Review | "Vision: From the Life of Hildegard von Bingen"
So many modern period pieces fall into an all-too-common trap - they feel fake, never escaping the feeling that all you are watching is a bunch of actors playing dress-up. They are the very definition of "costume dramas." 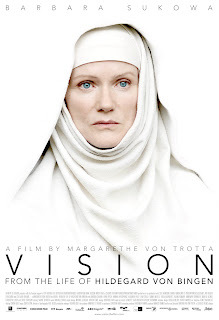 On the surface, that is exactly what Margarethe von Trotta's Vision: From the Life of Hildegard von Bingen appears to be, and it's ungainly title doesn't help. However, despite the fact that it's title has the ring of a dry, tedious history lesson, the film itself is anything but. What Von Trotta creates is instead is a vibrant and evocative recreation of another time, a deeply reverent portrait of one of history's pioneering women that few have ever heard of. As its title suggests, Vision is the true story of Hildegard von Bingen (the magnificent Barbara Sukowa), a 12th century German nun who claimed to have received visions from God, a claim that brought her both great fame and adoration, as well as great suspicion from jealous male peers. 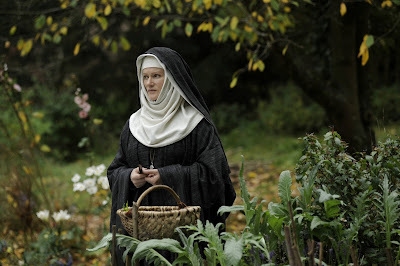 Barbara Sukowa as Hildegard von Bingen in VISION. A film by Margarethe von Trotta. However, much to the head of her order's chagrin, her visions are endorsed by the Pope, and she is looked to by many as a great teacher and prophet. She uses her newfound power to establish her own convent, intent on spreading the word of God to those who have not yet heard it, while exploring the sciences that fascinated her so and being a good steward of the Earth. She was a woman ahead of her time, she was a poet, a playwright, a composer, a scholar, but above all she dedicated everything to her faith. But even her faith, as strong as it is, can't save her from personal problems of her own, as she is betrayed by those closest to her, the ones who helped her overcome the obstacles of patriarchy and incredulity, and she begins to realize that she may not enjoy the full confidence of the sisters under her leadership. Vision is a lovely and lyrical film, and thanks to some striking production design (featuring great use of real medieval abbeys) and cinematography, it is a period piece that doesn't feel like a period piece. Its characters have very real hopes and dreams that aren't too different from those of modern women, and Von Trotta treats her subject with a great deal of veneration. Barbara Sukowa as Hildegard von Bingen and Heino Ferch as Brother Volmar in VISION. A film by Margarethe von Trotta. A Zeitgeist Films release. Everything about the film just feels right. Von Trotta strikes just the right tone of lyricism and piety to deliver a film that evokes a deep sense of religious faith without coming across as heavy-handed or preachy. It is a deeply felt biographical exercise that skillfully avoids the usual pratfalls many biopics succumb to. Von Trotta's consistently engaging style keeps the film moving, and despite a few dramatically inert moments, the film moves surprisingly well given its subject. It's never uninteresting, and Sukowa imbues Hildegard with a spirited sense of life. She is no dour nun, she is a woman of great spiritual intensity and fervor, and also a woman fascinated by the beauty of the world around her. So too is the film, consistently engaging the audience with its confidence. Vision is a striking film, a film that is not content to be a mere history lesson. Von Trotta takes a great woman who made great strides for women in the church, becoming one of the first female preachers, something that was unheard of in her time, and crafts a compelling and entertaining narrative that is as much about her life as it is her inner life. It's a costume drama that isn't about the costumes or the sets, it's about the people, and that may be its greatest achievement of all. VISION: FROM THE LIFE OF HILDEGARD VON BINGEN | Directed by Margarethe von Trotta | Stars Barbara Sukowa, Heino Ferch, Hannah Herzsprung, Alexander Held, Lena Stolze, Sunnyi Melles, Paula Kalenberg | Not Rated | In German w/English subtitles | Now playing in select cities. DVD Spotlight | "The Price of Pleasure"